Ogo 2.0: A Mobile Messenger or a Swiss Army Knife? The Ogo 2.0 (CT-25E) is a mobile messenger with a twist. This quad-band EDGE / GPRS gadget has the standard Bluetooth 2.0 connectivity, QVGA display, full QWERTY keyboard, 32 MB RAM, 64 MB Flash, but it doesn’t stop there. The OgoClip is a removable tubular device that can add different functionalities to the Ogo 2.0, such as a digital camera, a music streamer, a microphone or even a bottle opener (no kidding), along with other add-ons that haven’t even been invented yet, in a style that reminds us of the Swiss army knife. With Ogo 2.0 you can send text messages to your friends on ICQ or MSN, read and write your e-mail anywhere, download and view attachments like documents, PDF files and photos. You’ll receive any message from your mailbox instantly, thanks to the push e-mail feature. This device has a web browser and can even download RSS feeds to keep you up to date with all the things you care about. 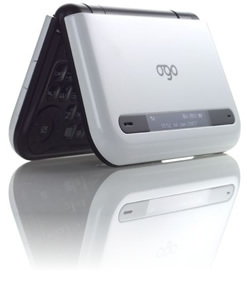 The Ogo 2.0 can also be used as a PMP and has a microSD slot to keep your favourite tracks. The price and availability of this device was not announced, but it seems a great option if you’re looking for a really useful mobile device. Read the press release at IXI Mobile, moreabout the Ogo 2.0, found via Engadget.